My squee over Tom and Michael's happy reunion. 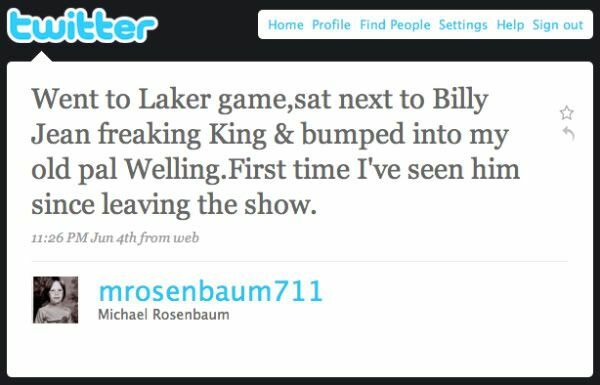 I'm still riding the high of seeing the vid that captured Tom Welling and Michael Rosenbaum's reunion at last week's Lakers game. Even now I'm clicking over to YouTube to watch it one more time. :) When Michael tweeted that this chance encounter was the first time he and Tom had seen each other since he left the show more than a year ago, I was sad, thinking they had drifted irretrievably apart. But seeing the joy of their reunion, that glorious hug, convinced me more than ever that these two are friends for life. And for some reason, that just makes me incredibly happy. Even after countless viewings, it's the anticipation of the moment that gets me every time. Watching Michael enter the frame, wasting no time as he moves toward Tom, and then seeing Tom point in jubilation, and rise, making his way over people to meet him, just makes my heart swell. And then that hug, that amazing tackle pounce of an embrace, is everything a fangirl could hope for and more. 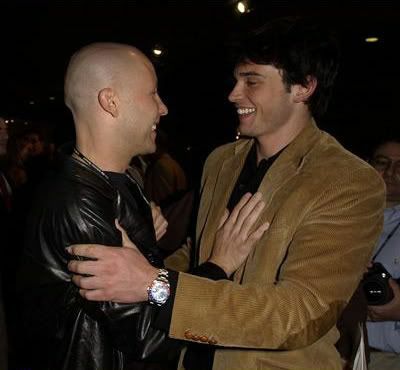 The usually reticent (in public, anyway) Mr. Welling pretty much jumps Michael, and wraps him in a gigantic bear hug. *happy sigh* Oh, boys. 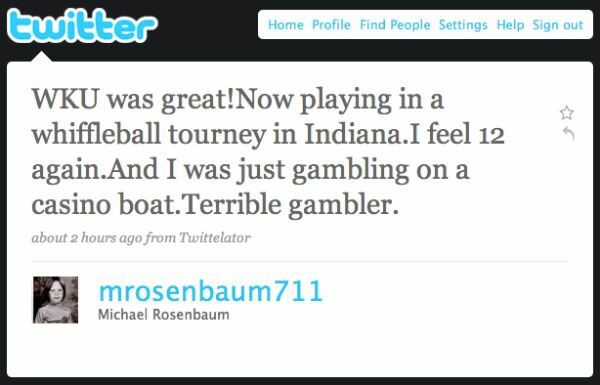 One of the best things about the guys running into each other at the game is that, because of Twitter, I heard about it first from Michael himself! Yes, Twitter is a bit ridiculous, and decidedly self-indulgent, but stuff like this also makes it awesome. I feel so fortunate that this moment was inadvertently caught on film, playing out wonderfully, albeit small and fuzzy, in the background behind the basketball game. It's nothing short of a treasure to me. And I will be eternally grateful to the diligent fangirl (or boy) who searched every frame of who knows how many clips to find it for us! If there's anyone on my flist who hasn't seen it yet, and wants to, or who just wants to see it again, here it is. 1) Let the video load and then advance it to 1:40. 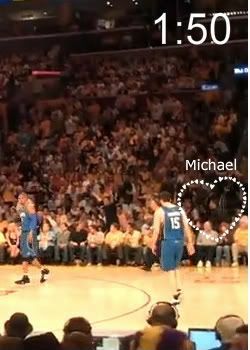 2) At 1:50 you can see Michael enter the frame from the far right, walking behind the front row of spectators, followed by three other guys. 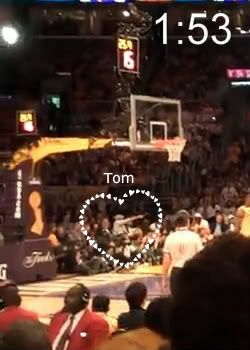 3) A few seconds later you see Tom point. 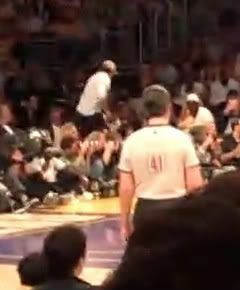 He's on the far left, under the net, wearing a baseball cap and a white shirt. 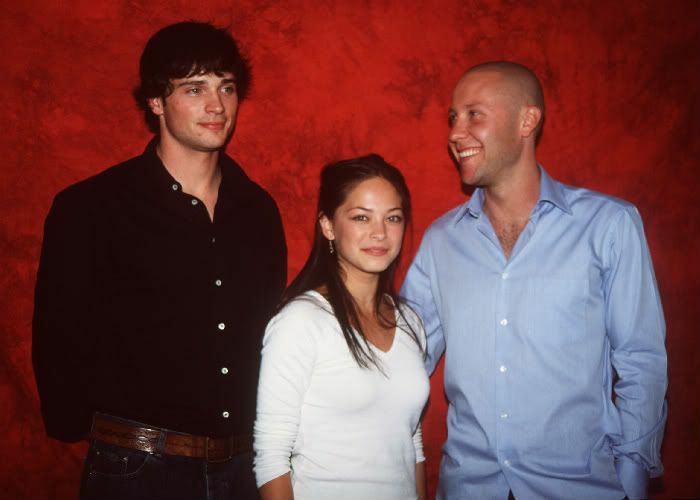 He then rises, unmistakably ginormous, and moves to meet Michael. Thanks to canadabear, who saw the vid on DTTW and reposted it to justtomwelling, where I first saw it. There are caps, too! Thanks to JayPat on DTTW for the caps, and to christina_kat for the heads up about them. Maybe it seems like I'm making way too much of this, but I don't care; it's just how I feel, and I know I'm not the only one. 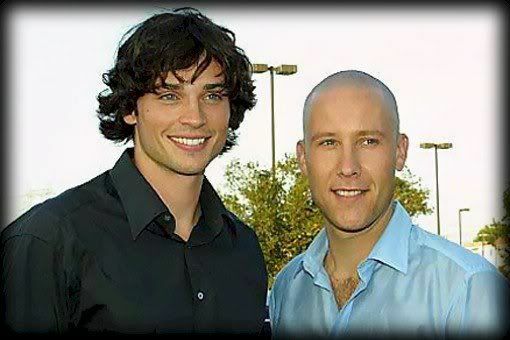 In celebration of Tom and Michael's all too brief but oh so sweet reunion, here's a little picspam of the boys together. Feel free to share your pics of them in the comments! Thanks to tasabian for many of these pics, and to SmallvilleDedication for the Backstage Special screen caps! Woah! That video is awesome! But now I have questions. a). 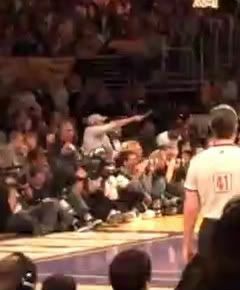 Was the person who shot this just a basketball fan who was filming the game and just happened to get the Tom & Michael reunion? b). If the answer to a) is 'yes' then who in the world knew that Tom and Michael's reunion was on that video??? a) Yes! It was total happenstance that it was recorded! Isn't that amazing? b) Once word of their reunion got around from Michael's tweet, people started combing all the clips of the game posted on YouTube by people who were there, as well as the TV coverage, looking for any glimpse of the boys. Luckily Tom was relatively easy to spot, being so tall and wearing something that stood out, but it still took an incredible amount of patience and devotion, as well as a set of eagle eyes, to spot that moment. Every Tom and Michael fan owes that person a debt of gratitude! We're so lucky! What if the action had been at the other end of the court right then? This posts makes me SO happy and makes me want to draw sparkly hearts all over everything! I don't think I'll ever get tired of watching that hug. Tom just launches himself at Michael! 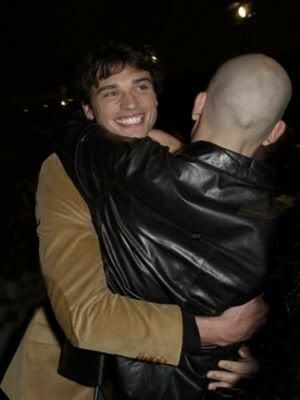 :) It's such a sweet reunion. That was so sweet!! I love that someone found the moment in the middle of the NBA game. That is some dedication!! Isn't that incredible? That fan deserves some kind of fandom medal! Ok, some of these pics I've never seen. I cracked up at the one with Lex holding the gun at Clark's head and Tom and Kristen are just laughing. And the sixth from the bottom, Tom's face! I have to watch that interview again...I need to find that interview again. Aww, this post totally made my morning. Thanks. Have you seen the still (very clear!) 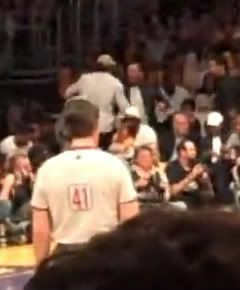 shot of them sitting together at the game, after the hug? Someone posted it in the TW thread on the kryptonsite forums... with bonus Kanye West. I'm horning in on your comment. I can't find the pic on K-site! Do you remember what page it was on or who made the post? Was it very far back? Lovely post! I'm glad their encounter made you so happy! It really did, Carol. It's just such a treat to see Tom so unabashedly happy. It's all I want for him, when everything is said and done. I'm glad you liked it! I know it's been posted far and wide already, but I just couldn't contain my squee about it! :) And I figured there might be someone, somewhere who hadn't seen it yet. 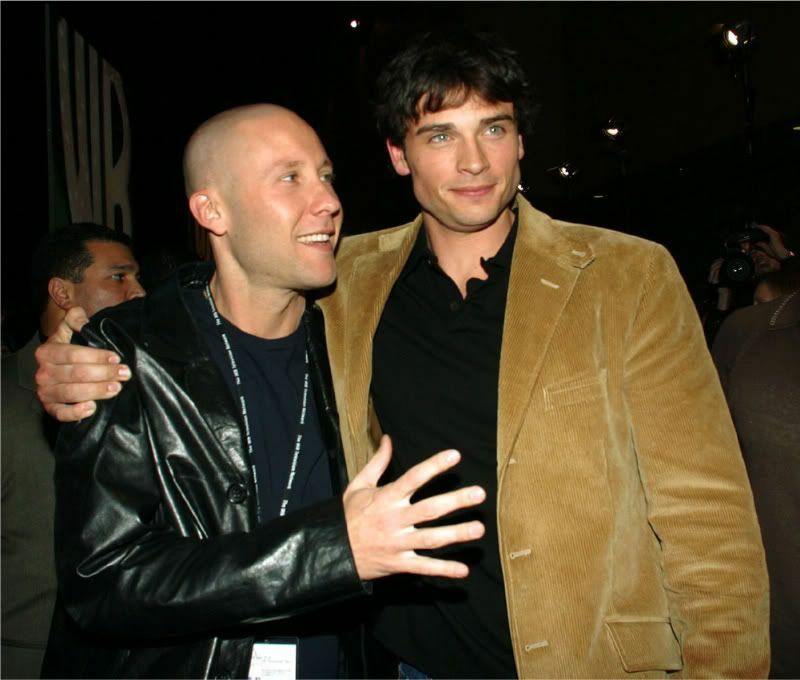 Even people outside the Smallville fandom can appreciate the joy of that moment. Such great fun to see this post and all these lovely BTS moments. Thanks for spreading the joy! This was such a wonderful post, and no, I don't think you're makinga big deal at all. I feel exactly the same way . . . it just made my heart happy, and still is. *HUG* When our boys are happy, we're happy. That's just how it is. When our boys are happy, we're happy. That's just how it is. 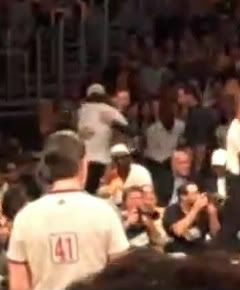 I can't believe we actually have footage of "The Hug"! It seems like a one-in-a-million chance, and yet there it is. In all its wonderful glory. And its just so great to see how genuinely happy they are to see each other. I wish we got more insight into the interactions between our cast when they are relaxed and themselves. Its why the BTS shots are so great. And occasionally we get another glimpse, like that great shot of Tom and Erica chatting at the CW upfronts. I love that stuff! This may have to hold us over for a while on the Tom front, but still...what a gift! I know!! I'm absolutely floored that the footage exists, AND that someone found it. It's such a gift to fandom. 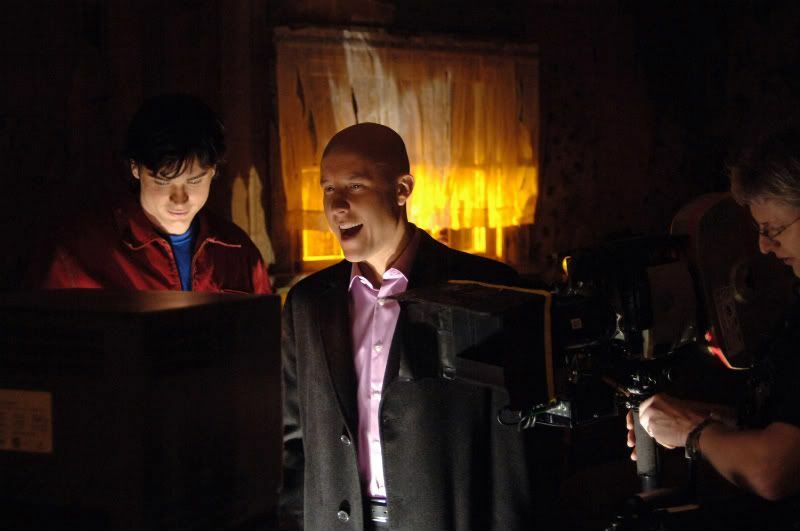 I love any BTS glimpses we can get. The pics Andreas has been giving us recently are so cool. And I agree about that pic from the Upfronts. I never saw that until you posted it, and it's one of my favorites now. Great post! I will never get tired watching this hug! I love the wellingbaum pics you posted! Michael looks so cute in the pics where he is looking at Tom and smiling! Me either! It still makes me smile, every single time! I love those early pics of the boys. They obviously adore each other! :) I want them to work together again so badly. 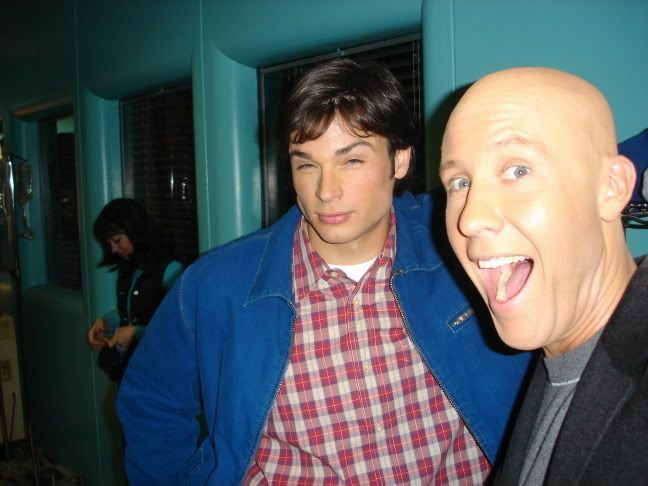 When Michael gets a sitcom, he has to get Tom to be a guest star. Glad you enjoy my caps (from DTTW). ;)) I enjoy yours too. Hey! Thanks so much for commenting! I hope you don't mind me reposting those. I checked on DTTW for rules, but that part under Site Info was blank, so I just used the rules I know from other sites (credit with a link back to the site). If that's not okay, just let me know. Or if I should change the credit to include your name, or anyone else's, of course I will do that. I so want to see these two work together again. When Michael gets his sitcom (because you know he will eventually), he'll have to persuade Tom to come on as a guest star. 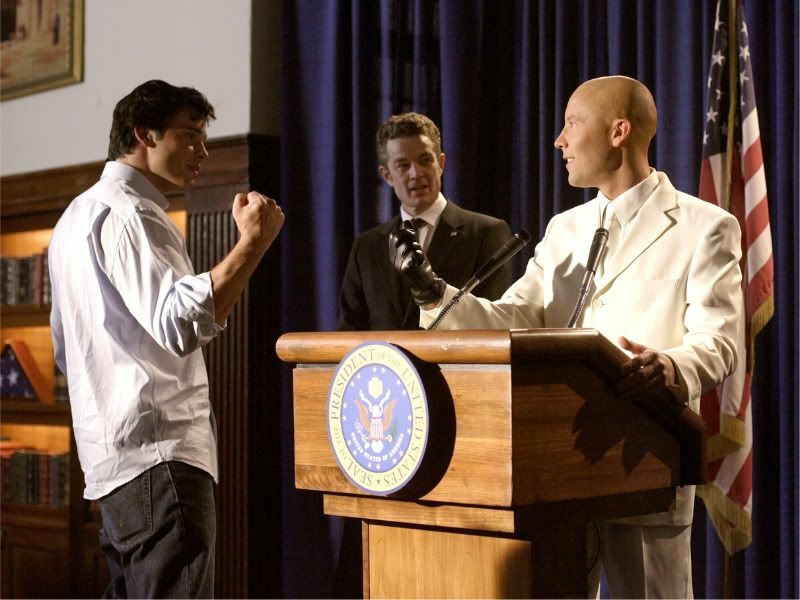 It would be great stunt casting for sweeps week! I can't help but giggle nonstop when I watch that video. Especially when Tom points. I dunno, there's just something about that point... like "HOLY SMOKES, IS THAT HIM!? *POUNCES*"
The hug could totally work as one of those slow-mo movie hugs. The music swells as the boys reunite. I know! The point is glorious! It's like Tom just couldn't contain his emotion in that moment. I love it!